When we started the blog, we knew that this would be a resource for us to share our projects AND others as well. There is no way one, or two, individuals would be able to come up with every salvage idea. It’s been a blessing to put others in the “spotlight” with such great projects like the viral Vintage Truck Fountain with over 5M views on Facebook. 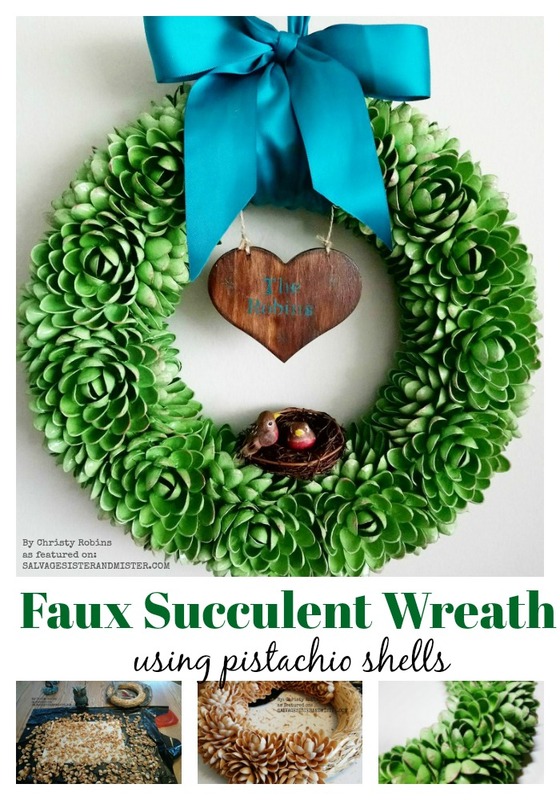 Today’s Faux Succulent Pistachio Wreath, from Christy Robins, is AHHH-MAZING. We are so honored she is sharing all the details with us! *Affiliate links are used to show products used (or similar). You can read our full disclosure here. I began by purchasing a large bag of Pistachio nuts at Costco (around a 2 pound bag). I spent hours opening them all at once, along side of my husband. What wasn’t ate right away, was put into a container. The next phase was washing them. I tossed them into a strainer and washed them with Dawn dish soap. 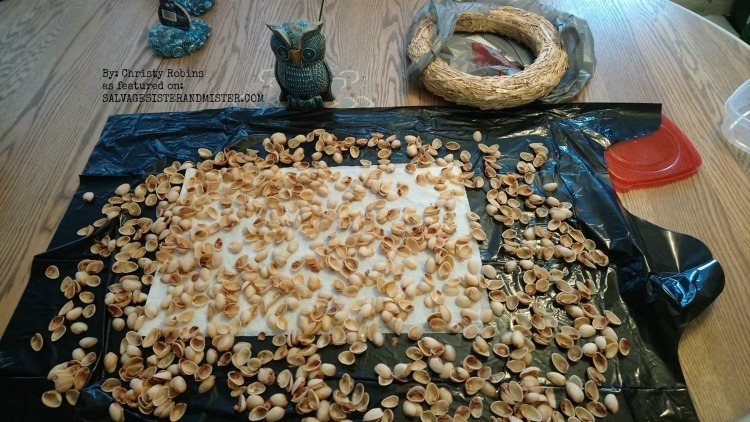 I then relocated the shells to my kitchen table, which I had prepped with a couple of garbage bag’s and some paper towels…to allow them to dry. A fan was also used to help dry them faster. 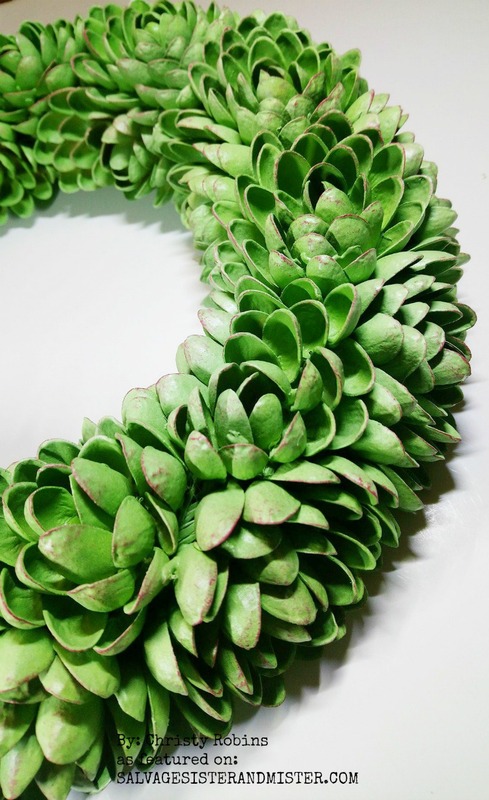 I began my next succulent on the inside of the wreath. Lastly adding a succulent to the side; I followed in this order the entire time. Note – No shells were added to the back so it could lay flat against the wall. I used two different shades of green spray paint…(Valspar Paint in this case) to give the succulents some depth and a more realistic look. Then took some latex paint that I had, mixed it to a pink that I liked, and dry brushed it onto random spots of each succulent. I made sure to also hit the edge of each leaf…But to avoid getting any pink on the inside of the succulents. Once my paint was applied and I was without a doubt happy with it…I sealed the entire wreath with Krylon ColorMaster Clear Finish. About three coats were applied to ensure longevity to my wreaths paint. I wanted to add Robins in a nest; that I knew from the beginning. Our last name is Robins, and I often refer to my husband as my bird. Also, I knew I wanted a little heart with our last name as well, so I went to Michaels and found the bird’s, nest, and heart for my sign. I couldn’t find any Robin’s, so I decided to purchase what they had anyway and repaint them to look like Robin’s. 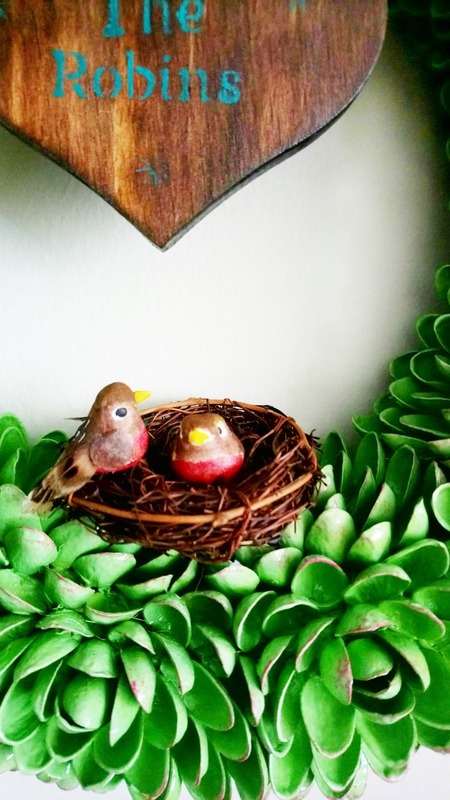 After my bird’s were painted, I glued them into the nest using my hot glue gun. I added the ribbon and the sign first however….the sign is held in place by the ribbon. Before gluing the nest onto my wreath, I had to drill two holes into my heart, sand it, stain, and stencil it. Finally, a clear coating was applied with Polycrylic. After a bit over three weeks…I finally completed my project. Well, are you blown away? Of course, we think it’s just stunning! 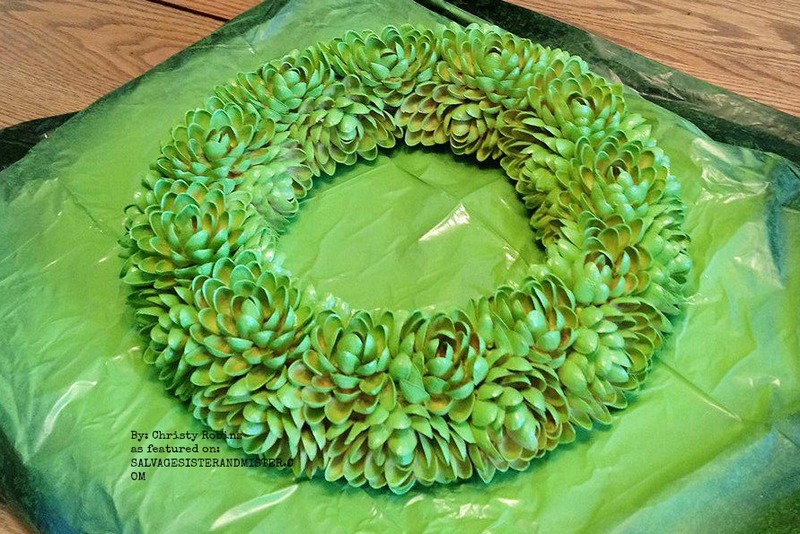 A huge thank you to Christy for providing the details on her faux succulent pistachio wreath. Now, if you will excuse us, we have some pistachios to eat. 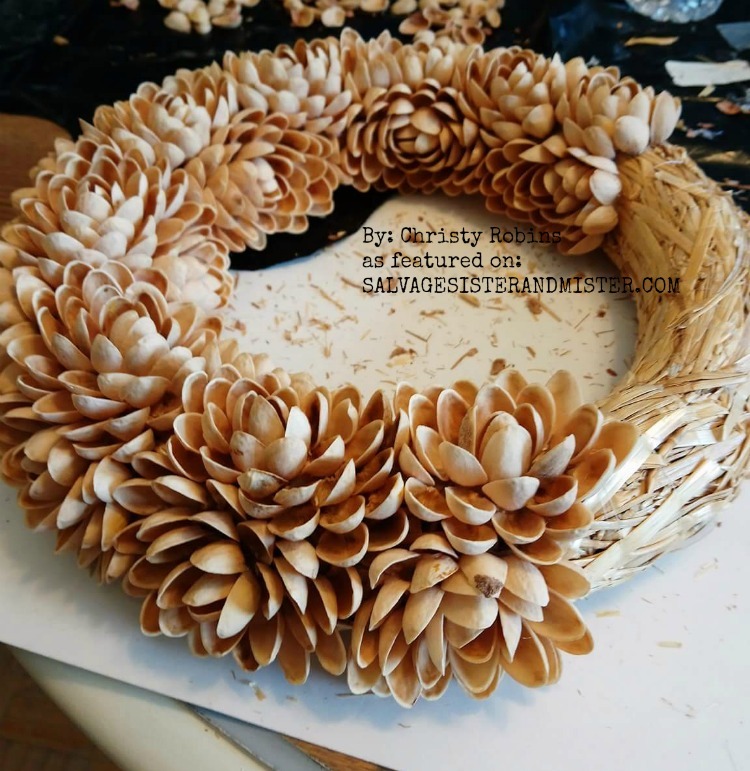 Be sure to visit Christy’s jewelry Facebook page here, and her furniture flipping page here. 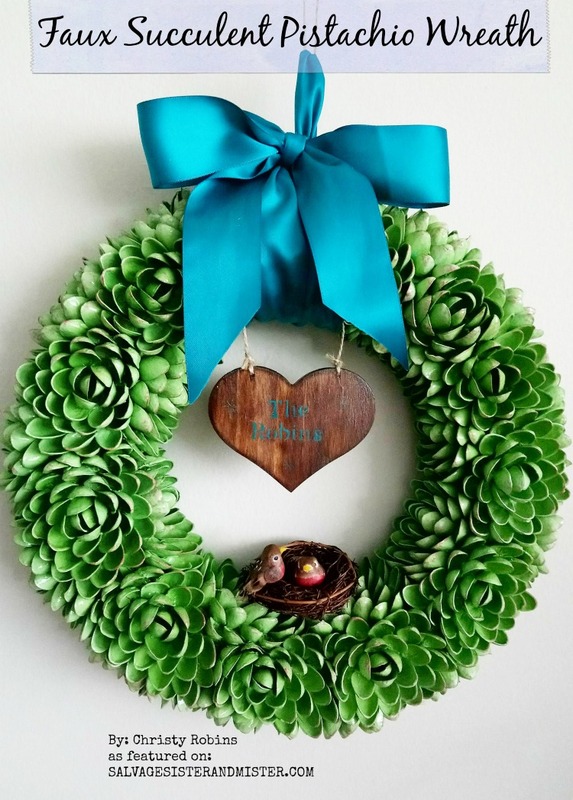 This wreath is breathtaking. All I can say is wow, beautiful work to be proud of. Congrats! OMG, i can’t imagine the work involved, its a well written tutorial.